Explore solar powered water heaters, advantages, benefits, installation and selecting tips. Check out the popular types, main components, how does the system work and how solar power can save you hundreds of dollars just on water heating. Who should consider buying a solar water heater? 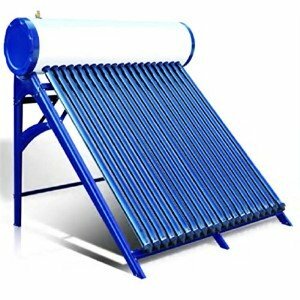 Who should consider buying a solar powered water heater? If you live in North America (US and Canada) you will notice that solar powered water heaters are much more expensive than gas and electric ones. However, the good news is that government provides great tax breaks to make them more attractive and affordable. The sun is providing free energy and many enthusiasts and handyman ideas and plans how to build. Even if you have to pay the full price, keep in mind that the sun is providing free and clean energy with no pollution, so why not to take advantage. Also, many enthusiasts and handymen have already built and tested them. So why not to use some of these great ideas and designs, when they are already available - for example here. Here, we are giving you some basic info and tips which can help you if planning to buy or make one. Or you can hire a professional. A good quality, professionally installed and well-kept solar powered water heaters (SPWH) can last from 20 to 30 years, almost twice as long as the conventional type. The payback period can be between 5 and 10 years, but it depends on many factors. Solar heating systems in residential applications can be found as solar water heaters, solar space heaters, and solar pool heaters. We will cover those that are used for potable water and pool heating. Sun exposure and orientation of the collectors. When it comes to sun exposure, the best results are on a clear day, while during overcast days, there will be approximately 60% less solar energy that will reach the earth’s surface. To maximize savings, the solar collector should be located near the hot water tank, while the tank should be located close to the point of use. Note: To maximize the system over the year, it is important to install the solar collector at the recommended angle (tilt angle), which should be equal to the latitude of your home. A solar powered water heater is designed to absorb the energy from the sun, utilizing the solar collectors, and then transfer the heat to water which is stored in a water storage tank. If the absorbed heat is not enough for heating water, then the backup heater is used, such as the electric, gas or oil type. Solar water heating systems are sized according to the hot water demand or how much one household uses hot water. More you use, larger the solar collectors and hot water tanks should be. For the family of up to 4, the water tank should have a capacity around 50 gallons, while the size of the collector should be from 2 to 5 m2. You will need roughly 1 sq. meter of collector area per person in your home. If you use less efficient solar collectors, then you will need to cover a larger area. Solar heating systems use the free and green energy and when used in combination with the electric or gas heaters, they can drastically reduce the energy consumption. According to some studies, properly installed solar water heating system can provide at least 50% of your annual hot water needs (but it depends on many factors). During the summer, it is possible to heat all the water just with the solar energy, while in winter much less, which means the backup heater has to be provided. These systems are effective regardless of the outside temperature (when the right type is used). If you would like to go into details use the energy.gov website to find more info about estimating the cost and energy efficiency of a solar water heater. There are several solar domestic hot water systems (SDHWS) that are mostly used. Some are more, some are less complex and even with the different heating process, systems can share the same components. Passive solar powered water heaters use gravity and natural convection so hot water can circulate through the solar collectors with no use of the external energy and moving mechanical parts. Note: The solar collector is actually a flat plate collector that is designed to capture the solar heat. There are also evacuated tube collectors which are cylindrical tubes filled with the vacuum for higher efficiency. The advantage of these systems is a simpler design, which makes them economical and less exposed to the problems. Great examples of the passive systems are the Integral Collector Storage or short ICS (also known as the batch heater) and thermosyphon system. See the DIY ideas here. Note: The thermosyphon system utilizes natural convection so the heated fluid rises and colder fluid falls, resulting in fluid circulation. Active solar powered water heaters use a circulation pump, controllers, and valves, which will force the heating fluid to circulate through the system, from collectors to a point-of-use or storage tank. Its advantage over the passive system is a better control and flexibility in installation. Active units can be used year-round since they utilize the heating fluid that can withstand lower temperatures. The most used and popular types are Drainback, Draindown, and Pressurized Glycol. The Drainback system is protected from both freezing and overheating as the transfer fluid drains from the solar collectors and piping when the pump is off, thanks to gravity. The drainback reservoir is used to collect the fluid from the collector. If the heating fluid is potable water, which is heated directly in the solar collector, we are talking about direct systems. The solar storage tank is also an absorber. Typical examples are ICS and Draindown systems. The advantage is that there is no energy loss as much as in closed-loop type because water is heated directly in the solar collector. This system is cheaper and has better performance. One of the major drawbacks is that these systems are subjected to sediment buildup and freezing. In indirect solar powered water heaters, potable water is heated by the heating fluid, usually the anti-freeze fluid such as glycol. The amount of heat transfer fluid is fixed and is circulating in the closed loop. The system must have a heat exchanger installed in the tank and used to heat water. Drainback and the Pressurized Glycol are great examples of the indirect systems. They are ideal for regions with the hard water and year-round, even winter time. On the cons side are the periodical replacement of the antifreeze and higher price tag. The simplest form of all the solar water heaters is the batch type. It utilizes the cylinder water tank painted in black, placed inside an insulated box and covered with the tempered glass. The storage tank is filled with water. They are recommended for regions with mild and warm climates. As the cost-effective way of heating, solar water heating systems can also be used to heat swimming pools and extend the pool season. As their operating temperature is lower (an average of 80 F) they are considered as low-temperature systems. In colder regions, they must be drained completely to prevent freezing. They are made of PVC pipes and rubber connectors, without the frame, insulation and tempered glass cover. Solar pool heaters are very affordable, flexible, easy to carry and install on the roof but as they are not insulated, they lose heat easily. The solar collectors and storage tanks are the main components of almost every solar water heater. Solar panels are designed to collect the solar heat which is passed to the heat transfer fluid or potable water. The most popular ones are the flat plate panels which consist of the insulated box, cover, absorber plate, and tubes. Those models with the cover are known as glazed flat panels, while those without are unglazed flat plates. There are also evacuated tubes and concentrators. Unglazed collectors are operating with the lower temperatures and are mainly used for pool heating. They are usually made of PP making them very flexible. As they do not have the glazing and insulation they have higher thermal losses making them ideal for warmer regions and not suitable for cold climates. Glazed flat-plate collectors usually come with the box, insulation and glazed cover allowing more heat to be captured and less transmitted outside (reduced loss). Evacuated tube collectors are made up of a series of glass tubes, and each tube is either single-wall or double-wall, filled with the vacuum, which works as an insulator. They are recommended for climates with colder weather, mainly due to the capability to retain heat longer than flat plate collectors. Concentrators or concentrating collectors are mainly used in industrial applications as they deal with high temperatures. Storage tanks are used to hold the solar heated water for future use and are usually equipped with the electric backup heating element to increase the temperature of water to the desired temperature, especially during the cloudy and cold days or nights. They are very well insulated to preserve the energy and can directly transfer the hot water to the tap or feed the gas or electric tank. The heat exchanger which can be installed inside the storage tank to transfer the heat from collector to potable water, wrapped around the tank or installed externally (all types belong to indirect systems). Gas or oil boilers can be used to provide auxiliary heat if solar heat is not sufficient for heating. An expansion tank is used as a buffer in closed systems to reduce the effects of the excessive pressure inside the tank. A circulation pump to move the heat transfer fluid through the system. A controller is used to power the pump when it is required so as to control the use of supplementary heating systems (gas, electric, oil). Thermometer for the temperature control. Note: It is more expensive to install the SWHS in an existing than the new house. If you live in the southern, warmer region, buying any type of the above mentioned solar powered water heaters will bring you comfort, convenience, and great savings. Great savings are noticeable in large households that use a lot of hot water. SDHWS can provide enough hot water for one household, which saves an overall used energy, plus it reduces the pollution. Based on many years of reliable water heating, ICS, Drainback and Pressurized Glycol are the systems that are recommended by the professional.